No matter how much you may feel like giving up, all hope is not lost for patients who are missing several teeth. Implant dentures can provide a stable and natural-looking replacement that lasts for decades. Instead of resting directly on the gums, an implant-retained denture is secured on implant posts which rest below your gum line and are placed by your Boston dentist. 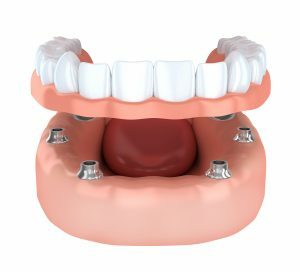 If you are dealing with a difficult traditional denture or have yet to find a suitable tooth replacement for missing teeth, implant dentures may be right for you. The top 5 signs you need this solution are listed below. Patients who are on the brink of tooth loss are in perhaps the best situation to get dental implants. This procedure is most successful right after the teeth have come out, as the implant posts will have maximum bone tissue available for successful anchoring. If you expect to lose teeth or have them extracted in the coming months, talk to your dentist about an implant denture. Dentures are reserved for patients who have lost several teeth or an entire arch in the upper or lower jaw. If your tooth loss is significant, an implant denture can help to preserve your jaw bone tissue and stabilize any remaining natural teeth to keep your smile healthy for a lifetime to come. A loose denture can make life hard. Sometimes, dental implants can be used to retain an existing denture which has lost its fit. Your dentist will evaluate the problem and determine whether or not dental implants are an option for your smile. A loose denture can keep you from eating the nutritious items that keep you healthy — like fresh fruits and vegetables, nuts, and whole grains. If you find that you are limiting your diet based on what you can chew, it may be time to talk to your dentist about an implant denture. Because it replaces the teeth’s roots as well as the crowns, this option provides increased stability to support a balanced, nutritious diet. An ill-fitting denture can cause serious discomfort. If yours is slipping around and causing blisters or other pain, it’s time to talk to your dentist about whether or not you can get an implant denture. You deserve a comfortable tooth replacement option — and your dentist wants to help you achieve it. There you have it — the top 5 signs an implant denture may be right for you. If you expect to lose teeth soon or if you are struggling with an ill-fitting replacement, don’t wait to find out whether or not you can benefit from this option! Contact your dentist in Boston ASAP. Kraft & Schrott Dental Associates offer high-quality general, restorative, cosmetic and periodontal services. If you are dealing with failing teeth or a loose denture, do not hesitate to contact the office to discuss implant dentures. Call the team at 617-977-5266.